The four Rotary Clubs in Lincoln had great pleasure in assisting with the smooth operation of the 2017 Lincolnshire Show (21st 22nd June) by providing lost property services, which generated many a huge sigh of relief as items were reunited with their owners, and comfortable baby changing facilities. In addition, the opportunity was taken to showcase the contribution that Rotary makes to Lincoln and globally. The free blood pressure tests were fruitful and well used. Also "Trade Aid" boxes promoted by the Rotary Club of Grantham Kesteven were on display. Thanks goes to District 1270 for advise on sources of Rotary funding to enable our presence at the show. 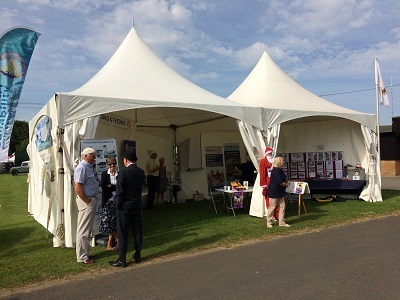 The Rotary stand at the 2017 Lincolnshire Show.